Sometimes you don't always make the best decisions (like trying to throw that flip just to impress your buddies), so why not hedge your bets with the Marker Phoenix Otis Helmet. 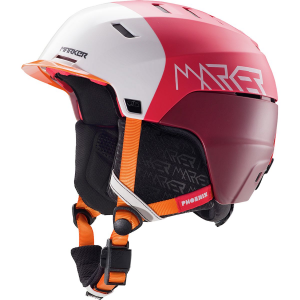 Exclusive to Marker, the EPS foam core is backed by MAP protection pads, which are placed in critical areas--such as the back of the head, forehead, and temples--and regains its initial form almost instantaneously so you're protected from multiple impacts during the same crash. The hybrid shell construction combines the weight and comfort of in-mold technology with the robustness of the hard shell construction for durability and style. In addition to offering state-of-the-art protection, the Phoenix Otis is equipped with a number of performance features to enhance wearing experience. An RTS fit system lets you adapt the helmet to your head with an easy to use adjustment dial for a customized and secure fit. Fidlock OG Snap closure uses magnets to ensure a secure hold that can be easily operated with gloves. The MarkAir Channel System consists of a precisely calculated network of vent openings and air channels for ventilation. This ventilation system can be controlled using the adjustable two-position climate control. A low-profile strap system at the back of the helmet keeps your goggles secure. Ear pads offer added warmth and are audio-compatible so you can test out that playlist you've been working on all summer. The anti-odor performance lining inside the helmet provides thermal-efficient, moisture-wicking comfort.